TORONTO -- Randy Davis remembers attending a social function not long after he'd been diagnosed with HIV and watching as the hostess greeted a succession of guests, giving each a warm hug. But when his turn came, the woman's hand went up and she suggested he not get too close because she had a cold. Yet people with HIV are often denied that experience -- a fact borne out in a Leger survey conducted for Casey House, which found that while 91 per cent of Canadians believe it's human nature to want to experience touch, only 38 per cent of respondents said they would be willing to share skin-to-skin contact with anyone diagnosed with the virus. "That's really tough for the human spirit -- and we know that touch is so important," said Simons. "So that was really the impetus to have a public conversation about HIV to try to challenge people's thinking and behaviour." "I remember when I was first diagnosed, the first thing that came into my head -- and I was single at the time -- was that I'd be alone for the rest of my life and no one would ever love me again, let alone touch me or hug me," said Davis, who volunteered to be one of the healers at the Casey House event. 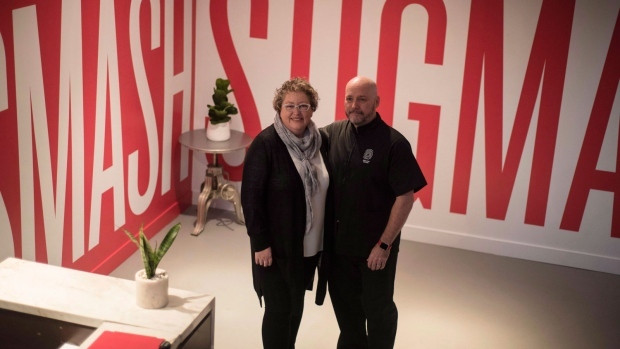 His hope for the pop-up spa is that people will come not just for a massage, but also to learn about people living with HIV -- "so that they can feel comfortable and realize that, you know what, we are not a risk to anybody." Massage appointments can be booked by visiting: www.smashstigma.ca.